Undocumented immigrants who arrive as children may be well into their 40s before they get a green card. In a bustling room at the Third Presbyterian Church in Albuquerque, New Mexico a group of white and Latino parishioners gathered for a workshop on immigration. They wanted to learn more about the issue. Alvarez’s personal experience with our nation’s immigration system illustrates this harsh reality. Mexico’s weak economy pushed Alvarez out of his country in 1996. “When I decided to immigrate to Albuquerque, New Mexico I had 5 pesos — or less than a dollar — in my pocket and a family to feed,” he recounts. Upon his arrival, Alvarez’s U.S.-citizen brother sponsored his petition for U.S. residency. As allowed by federal law, he included his wife, Myrna, and their school-age son, Edgar, in his application. He hoped that all of them could eventually reside in the United States legally. Since then, Alvarez has established a successful automotive repair shop, bought a home, and saved enough money to send his child to college. But our broken immigration system has left him standing in that immigration “line.” And a recent Supreme Court decision just made things worse. 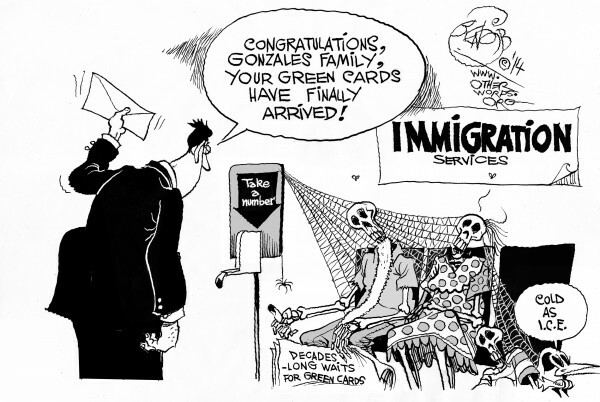 It takes the Citizenship and Immigration Services agency an average of seven years to grant immigrants green cards. Due to the structure of the immigration system that imposes a per-country cap, the wait now lasts more than two decades for Mexican immigrants. As long as the petitioners’ dependent children don’t come of age during that period, they remain eligible for green cards. If those children turn 21 before the family reaches the front of that proverbial line, a Supreme Court majority recently ruled, those young immigrants “age out.” They lose their place in the immigration line where they may have stood for most of their young lives. That’s a brutal reality for the Alvarez family. Julio Alvarez has waited 16 years for his green card. He probably needs to wait two more years — or even longer. Meanwhile, Edgar will turn 21 and lose his place in the line he has waited on for more than half his life. If Edgar, an engineering student at the University of New Mexico, applies for his own green card, he’ll be in his 40s before he gets to the front of the line. Tens of thousands of people face this Orwellian predicament. The new ruling makes congressional action even more urgent. But House Majority Leader Eric Cantor’s stunning defeat to David Brat in his recent primary means that the already stagnated immigration reform debate may hit a dead end on Capitol Hill. According to conventional wisdom that ignores the prevailing views in that Virginia House district, anti-immigrant fervor helped Cantor’s tea party challenger pull off a surprise win against a candidate who outspent him 40:1. This is bad news for Edgar Alvarez, who will turn 21 later this year. After he reaches that milestone and graduates college, he may be forced to move to Mexico, a country he barely knows. If Edgar wants to stay here he has limited options: He can marry a U.S. citizen or resident. Or he can find an employer to sponsor his green card. Few employers make this commitment because it’s a costly and time-consuming process. If Edgar can’t find a path to shedding his undocumented status, his New Mexican community will feel the loss. The young man engages in local politics and campus life. He pays taxes, mentors younger boys who are aspiring engineers, and works as a public health advocate. How can the United States turn its back on the more than 560,000 talented, young adults that are in a situation similar to his? Our nation can certainly do better than that. In 1836 Texas declared independence from Mexico, primarily over the issue of slavery, which Mexico had abolished in 1829. Mexico never relinquished sovereignty over Texas, and since slavery was an issue in the United States as well, it wasn’t until 1845 that a Southern president, John Tyler, formally annexed Texas as a slave state, precipitating the Mexican-American War of 1846-1847. American forces quickly occupied 525,000 square miles of Mexican territories that are now California, Arizona, Nevada, Utah, and the western parts of Wyoming, Colorado and New Mexico as an assertion of its “manifest destiny” to become a continental nation. What was left of Mexico was then invaded from several directions, and after a year and a half of war, Mexican forces were forced to surrender. Under terms of the 1848 Treaty of Guadalupe Hidalgo, Mexico relinquished sovereignty over Texas and ceded the occupied 525,000 square miles in exchange for $15 million (4.5¢ an acre / $1.20 an acre in today’s money) and some important political concessions. Article 8 of the treaty states that “Mexicans now established in territories previously belonging to Mexico … shall be free to continue where they now reside” and automatically become full American citizens one year from the exchange of ratifications, so in the context of Article 8, “now” meant May 30, 1949. Article 9, which was rewritten by the US Senate during the ratification process, redefines “now” as an indefinite “proper time” in the future. It also states that “in the mean time” they “shall be maintained and protected in the free enjoyment of their liberty and property, and secured in the free exercise of their religion without restriction.” As congress has yet to decide that the “proper time” for full citizenship has arrived, “in the mean time” means now  and Mexican-born residents of Nevada and other western states still have treaty rights to live and work here, with or without a green card. Isn’t it time our country followed the law and showed some respect for the people we agreed to share the west with all those years ago? The treaty has no document requirements, so can we please stop calling our Mexican friends and neighbors “undocumented”? And since the treaty clearly recognizes the right of Mexicans to be here, isn’t it time we stopped calling them “aliens”? It’s also worth looking at what has happened in US-Mexican relations in the decades since the Treaty of Guadalupe Hidalgo took effect 165 years ago. Believing that the treaty meant what it said, the Census Bureau counted Mexican-born residents of the west as US nationals in every census from 1850 to 1920. Only since 1930 have they been treated as foreigners. The Treaty of Guadalupe Hidalgo was in effect over 40 years before a joint survey team determined exactly where the border actually was, and then only to insure that the US Navy had access to San Diego harbor. After immigration from Europe and Asia was almost completely shut down in the 1920’s, Mexican workers were actively recruited to relieve the resultant labor shortage. When the Border Patrol was established in 1924, only ten agents were assigned to watch the entire southern border out of a single office in El Paso, Texas. And they were looking for illegal Chinese immigrants, not Mexicans. There weren’t even any fences along the southern border until 1949, and then they were only put up to protect US ranchers from cattle infected with hoof and mouth disease. Though there were mass deportations of questionable legality during the economic depression of the 1930’s, the Bracero program once again recruited Mexican workers to fill labor shortages in the 1940’s, 50’s and 60’s. Until 1965, there were no immigration quotas for Mexicans, yet only in the past 50 years have “illegal” workers from Mexico been considered fair game for exploitation that would otherwise be considered illegal, and targeted for detention and summary deportation that make a mockery of due process and basic human rights. Awareness of the needless deaths, dislocations and disruptions of family life resulting from these draconian measures have become an increasingly heavy burden on America’s collective conscience, so the time has come for all of us to give serious thought to our moral and legal obligations stemming from Articles 8 and 9 of the Treaty of Guadalupe Hidalgo, which is both an unfulfilled promise and the law of the land.